Not just in Truro – a new film by Thomas Bena, One Big Home, documents an issue that is as tricky for residents of Martha's Vineyard as it is for beach destinations everywhere: how to protect small communities from the distortions created by an influx of wealthy visitors who come for just eight weeks of the year. Massachusetts: Arlington, Chatham, Duxbury, Edgartown, Martha's Vineyard, Nantucket, West Tisbury, and Woods Hole. Rhode Island: Newport and Providence. Maine: Bar Harbor and Brunswick. Vermont: Burlington and White River Junction. New York: Sag Harbor. New Mexico: Santa Fe. California: Newport Beach, North Hollywood, Pasadena, Santa Monica and West Los Angeles. Photo of 11,000 sq. ft. house in Chilmark, courtesy of filmmaker Thomas Bena and Cape Cod Aerial. 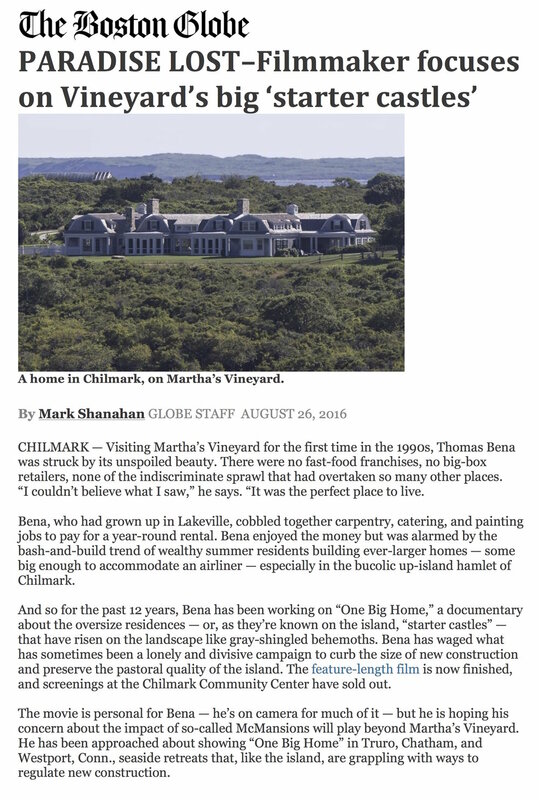 Trophy homes threaten the unique character of Martha’s Vineyard. Ten, fifteen, even twenty-thousand-square-foot houses are going up around the Island. Not only do these mansions stand in stark contrast to traditional cottages, most sit empty for ten months a year, yet are heated year round. When he feels he is complicit in wrecking the place he calls home, one carpenter takes off his tool belt and picks up a camera. Bumping up against tired clichés, angry homeowners, and builders who look the other way, he learned "you can draw a circle and bring people in, or you can draw a line and keep them out," so he worked with his community of Chilmark that in 2013 passed a new bylaw that limits house size. One Big Home featured on the Front Page of the Boston Globe, Saturday, August 27, 2016.